My brother spent the day with me today and wanted to make this dessert he found on Pintrest. Actually, he wanted to make something he found a picture of on Pintrest. Great. We went to my Stop and Shop to gather stuff for these Apple Apple Pies and for the dinner I was planning on making that night (Baked Crunchy Pork Chops with roasted veggies). Apples acquired, we started our experiment. 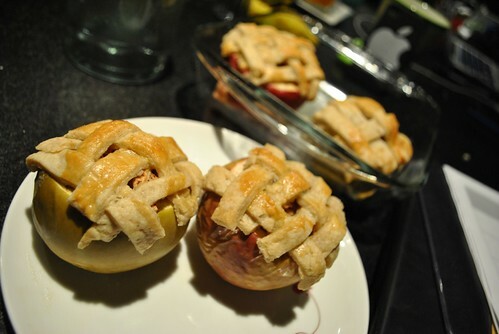 I figured, these were simply just Baked Apples with a cute little lattice pie crust on top. I already did Baked Apples, and as much as I am inept with pie crusts, this was a good way to practice. First I made the crust. I followed Rose Levy Beranbaum’s recipe for Basic Flaky Pie Crust in her Pie and Pastry Bible. The recipe was for a 9 inch pie shell. For four little apples, that was too much, so I halved everything and put my kitchen scale to work. I also did not have any Apple Cider Vinegar. I have Red Wine, Balsamic, White, and Chinkian Vinegar. Just no Apple Cider Vinegar. Since I was halving the recipe, I figured I just sub with some White Vinegar and it should be no big deal. I also used 1/3 Whole Wheat Pastry Flour and 2/3 All Purpose Flour. I also did not follow her method of putting this dough together by hand. I have never had any luck making pie crust in a food processor, and I somewhat succeeded when I did it by hand. 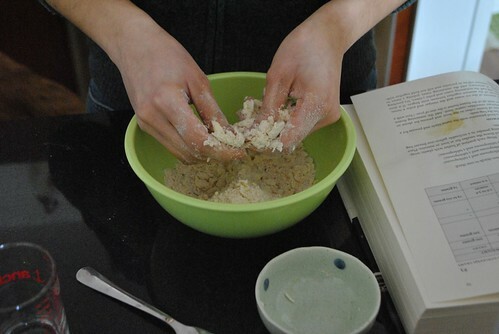 Her method to do it by hand is involved, whereas mine was messier and probably did not result in as flaky as a pie crust. 2 oz of unsalted butter. Cube and keep it in the fridge until you need it. First mix together the flour with the salt and baking powder in a medium bowl. 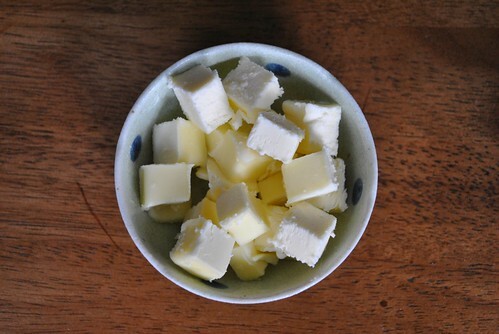 Then take the butter out of the fridge and throw all the cubes into the bowl. You don’t have to rush through this step, but don’t take your sweet time either, otherwise the butter will get warm, and that is not good for the crust at all. Once the butter is in, start mushing the butter cubes into the flour mix until the flour mixture looks kind of like wet sand or has pea sized clumps. Then pour in the water and vinegar and continue mixing until the dough comes together. Turn the dough out on some plastic wrap. Form into a disk and put it in the fridge for at least an hour. Gather, 6 Apples. Four are for the pie, and two are for the filling. We used two Cortlands and two Granny Smiths as the Apple portion and two Granny Smiths as the inside stuffing. About a Tablespoon of Apple Pie Spice (See my Baked Apple entry). Sugar (A few tablespoons..maybe?) I used a Vanilla Sugar I had on hand. It’s basically a vanilla pod graveyard with sugar I keep in a jar. While the dough is in the fridge, take the two apples to be used as stuffing and peel and slice them into about 1/8″ slices. Toss with a few spoonfuls of sugar (enough to lightly coat), place in a colander on top of a bowl. Let it sit for an hour. 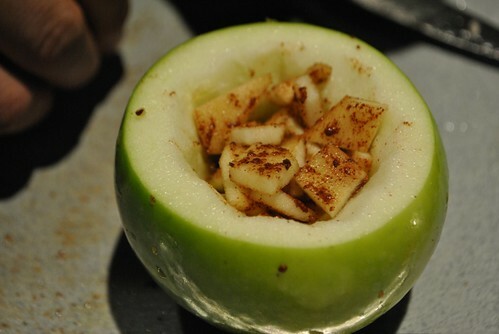 After an hour, take the sliced apples and toss them with the apple spices. Preheat your oven to 350 degF. Take the four apples you want as your base and give them a good washing. 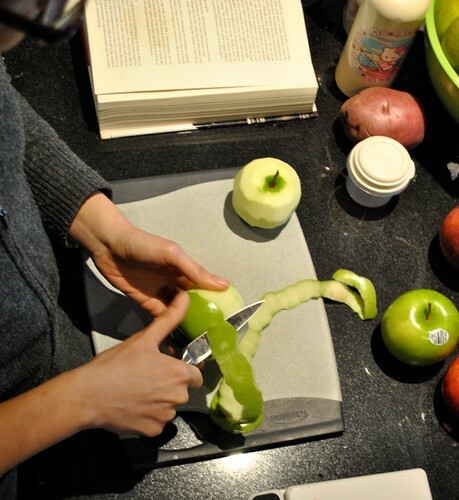 Slice off the tops of the apples (about 1/2″ – 1″ from the top). Take a small teaspoon and start digging for apple seeds. Once you get all the seeds out, you’re done. Don’t go through the bottom of the apple! Give the cored apples a splash of lemon juice to stop them from browning too much. 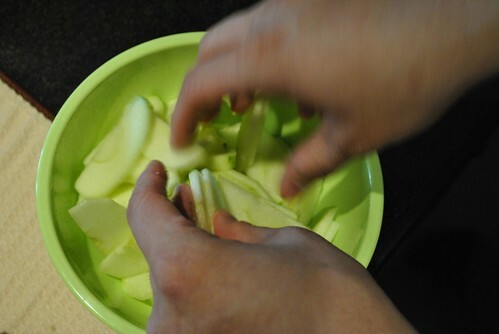 At this point we realized that we needed smaller apple pieces to use as filling, so we diced up the slices. I think this step can also be done at the beginning too. We weren’t thinking ahead too much. 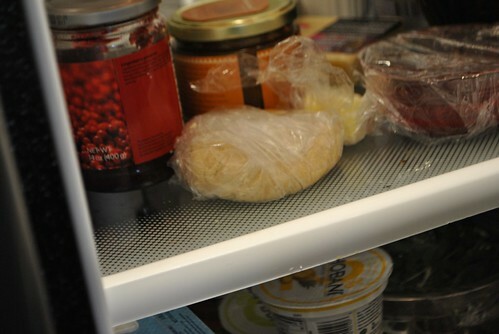 Take out the pie crust from the fridge and roll it out on a lightly floured surface. I rolled it out till a little less than 1/8″ thick. Take a paring knife and slice up the dough into strips. 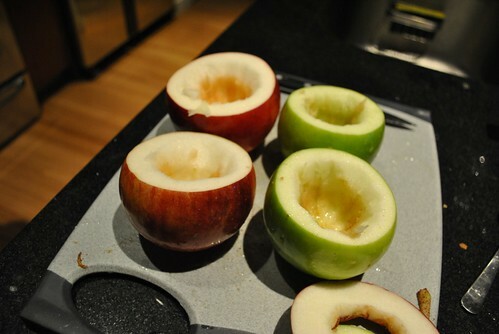 Fill the cored apples with the diced apples. Take the strips and make a lattice pattern. 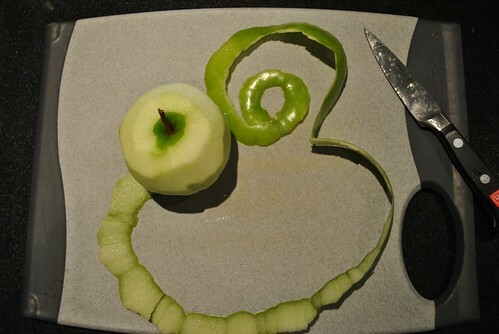 First I did this on the apple, and that was messy. 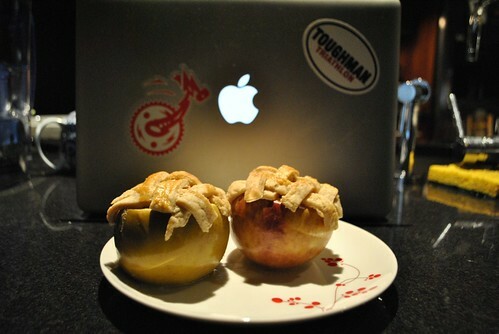 So, I made the pattern on the table first and then transferred them onto the apples. Brush a little egg wash on top and then bake them in a dish with a little hot water on the bottom of the dish. I think these took about 45 minutes. Basically bake until the crust is golden brown and the apples are soft, but not mushy. Let it rest a few minutes before attempting to move them. It was a rather yummy and filling dessert. 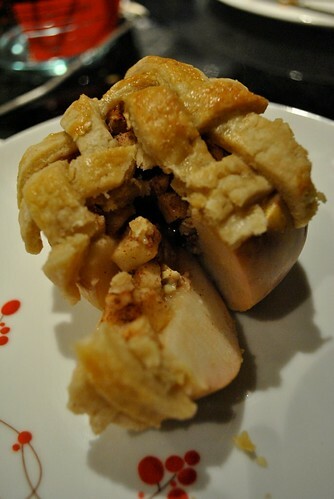 I liked that it was basically an apple pie filling in an apple with a little crust on top. All the sweetness associated with this “Pie” was from the apple. I think the total amount of sugar used didn’t even amount to a tablespoon between the four apples. Healthy right? 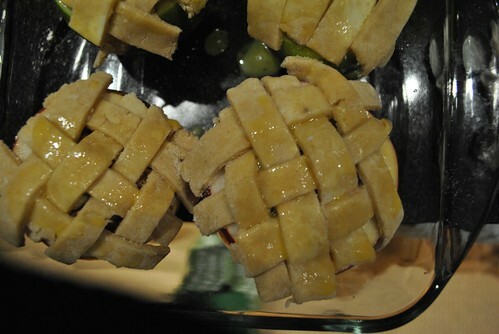 This entry was posted in Dessert, Fruit and tagged Apple, Dessert, Pie Crust, Pintrest. Bookmark the permalink.